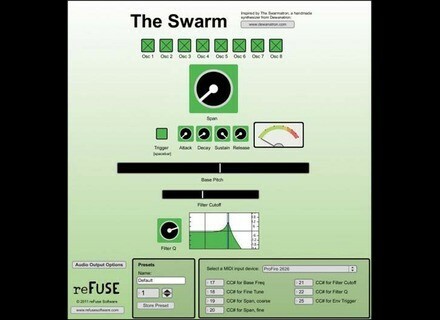 The Swarm, Other Virtual Synth from reFuse Software. The Swarm is based around a bank of eight oscillators that start out tuned in unison. Using the Span knob, you can continuously stretch out that cluster of notes from unison to, at the widest setting, evenly spaced harmonic multiples. Along the way, all kinds of dissonant tones and beat frequencies are created. The Swarm was released as a standalone application only. 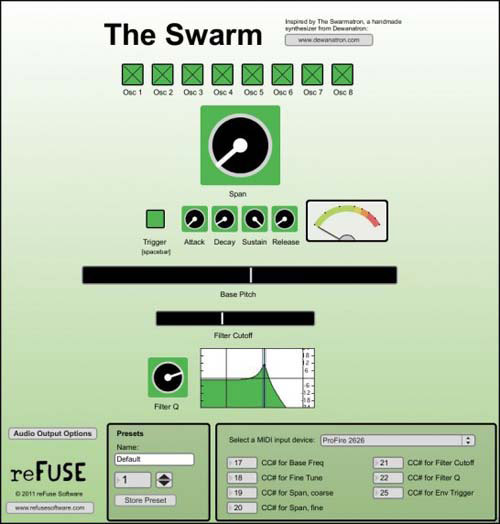 It is not available as a plug-in at this time, but the audio output of the The Swarm may be sent to ReWire-compatible host applications. For more details, head there. Mildon Studios Strummer 2 Mildon Strummer 2 is a MIDI strumming engine that can strum compatible VSTi's and sample players such as Kontakt, SampleTank, G-Player, and others. Tempo Rubato NLogSynth PRO Tempo Rubato has released version 3.3 of NLogSynth PRO, a virtual analogue synthesizer for iPad. LeXTAC & LeGion for Mac LePou Plugins has announced that LeXtac and LeGion are now available as both VST and AU effect plug-ins for Mac OS X.